Kepco will modify the standard models you see here and in our catalog to give you custom solutions in cases where the standard voltage or current don't quite match your requirements, or where you need special features that are not standard. Modifications to our standard models can now be requested via our new on-line Modification Request. Modified models can also be included in a custom rack mount assembly with other standard or modified models to give you a custom power solution that exactly matches your requirements. Through our power assembly program we can also create power system solutions in customer specific packages as well as provide solutions requiring a complete rack of equipment. Kepco will combine linear and switching power supplies, display and control panels and various input/output terminals to create semi-custom rack assemblies that meet your needs. To speed the process, we have created and stock, a variety of front and rear panels in multiples of 1/8 of a standard 19" rack. Eight of those panels or combinations of larger panels adding up to 8/8 may be combined to provide you with a nice selection of input switching, metering, pilots, trimmers and test points. Filler panels cover unused portions of the front and rear panels. Once you understand Kepco's Power Assembly concept, take advantage of our new on-line Power Assembly Quote Request to let us know what you need. If you're not sure about accesories or front/rear panel components, don't worry about it, just fill in the requirements you do know. We'll get back to you to help you configure the final product and get all the details. Of course you can always contact a Kepco Sales Engineer by phone, fax, or e-mail on-line query to help you meet your Power Assembly needs. Our service includes installation of the power units you've selected (or we recommend) into one of 11 rack drawers; professionally harnessing them to the front meter and control panels, and to the rear input/output panels, and testing the completed assembly. We can mark the terminals as you require, custom screen and paint the panels if you wish and will provide a system manual that contains the layout in addition to the manuals for each individual module. 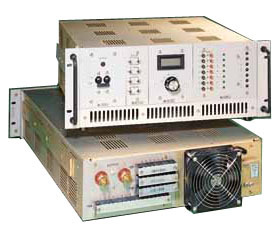 Kepco's power assemblies are a good solution to the need for multiple output power in industrial test applications. We'll do all the work and will deliver a fully tested, warranted product under a single part number ready to slip into your system...hassle-free. We're fast, too. Try us. On the following pages are the selection of input, output accessories and panel hardware with which you and we working together can create a semi-custom assembly for you. If you wish, Kepco's staff will take your requirements and suggest one or more possible assemblies for your consideration. The Power Assemblies illustrated are typical of many units supplying system power for Kepco customers across the country.